"An excellent finger-lickin'-chicken to dip into Uncle Bill's Sweet and Sour Sauce (see footnote for recipe link)!" 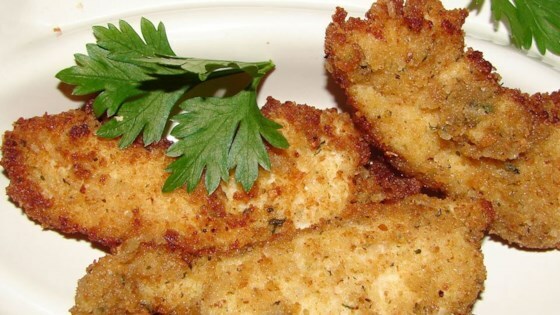 Dip each chicken strips into buttermilk mixture, then into bread crumb mixture (about 4 strips at a time), and toss to coat well. Place strips in a single layer in a 9x13 inch baking dish and drizzle with melted butter/margarine. Bake in the preheated oven for 15 minutes or until golden brown, turning once after about 8 minutes of baking time. Serve with Uncle Bill's Sweet and Sour Sauce. I didn't think these were worth the work. They weren't even that time consuming-I just felt these weren't much better than breaking open a box of Tyson or Banquet chicken strips. This was a pretty yummy and simple recipe. Turned out moist and tender, but a little soggy due to the butter. I used regular milk and a few drops of lemon juice instead of buttermilk. My kids love this and have been requesting it often. It reheats great in the oven but not the microwave. My guests thought these were very good. I used Panko Italian bread crumbs. I also deep fried mine instead of baked them for crispy texture. NASTY! I followed the recipe, they were just nasty!!!! !